I authorize THE VEITZENER KOLLEL to debit the bank account indicated in this web form for the noted amount on the schedule indicated. I understand that this authorization will remain in effect until the schedule end date, or until I cancel it in writing, which ever comes first, and I agree to notify the business in writing of any changes in my account information or termination of this authorization at least 15 days prior to the next billing date. If the above noted payment date falls on a weekend or holiday, I understand that the payment may be executed on the next business day. I understand that because this is an electronic transaction, these funds may be withdrawn from my account each period as soon as the above noted transaction date. In the case of an ACH Transaction being rejected for Non Sufficient Funds (NSF) I understand that the business may at its discretion attempt to process the charge again within 30 days, and agree to an additional $25 charge for each attempt returned NSF which will be initiated as a separate transaction from the authorized recurring payment. I acknowledge that the origination of ACH transactions to my account must comply with the provisions of U.S. law. I will not dispute THE VEITZENER KOLLEL’s recurring billing with my bank so long as the transaction corresponds to the terms indicated in this agreement. For more information on the Kollel, click HERE. With your generous help, you are furthering the dedicated learning of Torah, and continuing the inspiration towards spiritual growth that the Veitzener Kollel embodies! THANK YOU ALL VERY MUCH FOR YOUR SUPPORT YOU ALL HAVE A CHELEK IN TORAH!! 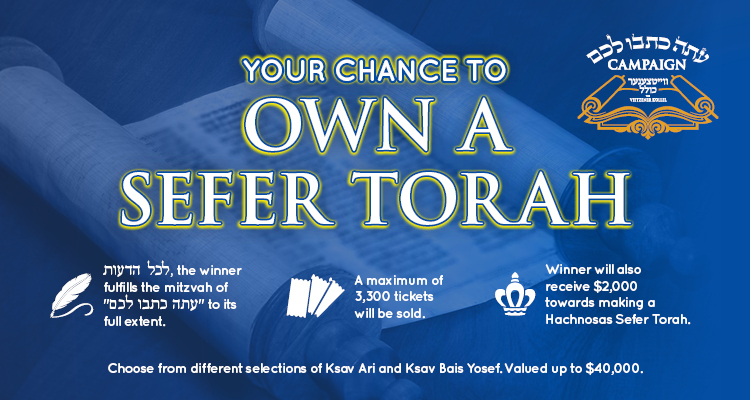 And we have a winner: Joseph Younes of Chicago is BH the proud owner of his own Sefer Torah!! DONATIONS AND PLEDGES STILL WELCOME! !